A hedge fund’s fee structure commonly consists of a management fee (typically 2% of assets under management) and a performance fee (typically 20% of profits). This is different from the costs commonly associated with investing in mutual funds, where investors typically only pay a management fee. Hedge funds’ particular fee structure is often referred to as a ‘2/20‘ fee structure. In addition to the above-mentioned headline fee levels, some other aspects of hedge funds’ fee structure are also important. The presence of a high-water mark clause, the use of a hurdle rate, and the crystallization frequency also impact the amount of fees that investors have to pay the hedge fund manager. In the Excel spreadsheet at the bottom of this page, we illustrate the impact of all these different aspects of a hedge fund’s fee structure. The high-water mark clause or ‘loss carryforward’ clause ensures that a hedge fund manager can only charge a performance fee on new profits. As such, if the manager incurs losses, he first has the recover these losses, before he can charge a performance fee. In the majority of the cases, a hedge fund’s fee structure includes a high-water mark clause. A hurdle rate is a minimum rate of return that the manager is expected to generate before he can charge a performance fee. For example, suppose the manager is subject to a hurdle rate that equals 2%. This means that the manager should generate at least 2% per year and can only charge an incentive fee on the return in excess of that 2%. The crystallization frequency or incentive fee payment schedule refers to the frequency with which investors have to pay the incentive fee to the hedge fund manager. It is also the point in time where the hedge fund updates the high-water mark. For more information on how the crystallization frequency impacts investors’ fee load, have a look at the page on hedge funds’ crystallization frequency. The particular fee structure of hedge funds makes it difficult to determine the expected fee load. The total expense ratio not only depends on the assets under management, but also on the particular performance of the fund. In the Excel spreadsheet we use a simple example to show how hedge fund fees impact investors’ net returns. 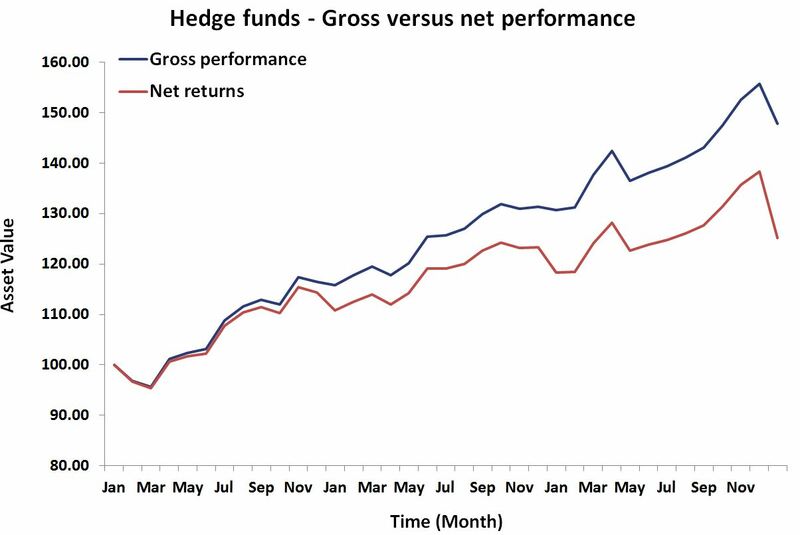 Hedge funds’ fee structure differs considerably from the fee structure of mutual funds. Their compensation not only depends on the assets under management, but is also based on the funds’ performance. The bettter the performance, the higher the compensation for the hedge fund manager.